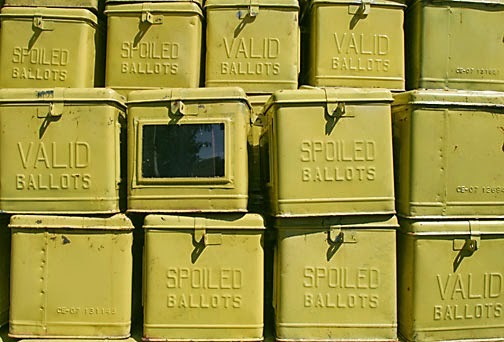 Ballot Boxes by Keith Bacongo is licensed under CC BY 2.0. Recently I was asked for my opinion on the Washoe County primaries by a libertarian-leaning Republican. After blasting off some superficial thoughts via email, it occurred to me that he might not be the only one wondering who I support. This one was an easy one. The Libertarian Party of Nevada endorsed him almost a month ago and I've been volunteering for his campaign for a while now. I have no doubt that there are more libertarian-sounding candidates in the race - though it would take some effort, what with his incisive fiscal analysis of Reno and with his willingness to discuss business property rights - but when it comes to action, he's the one candidate that took Reno City Council candidates to court and won. Plus, there aren't any registered Libertarians in the race. To be honest, I'm going all-in on this race. This is the first chance in years that people in Reno have had a credible chance to take on the entrenched political families in the area. I, for one, would like to take advantage of it. Citizens Outreach PAC recommends Ron Knecht, and though I have no doubt they know more about the race and the candidates than I do, I personally find it curious that they went with the one GOP candidate that isn't a CPA. Based on their interviews of the candidates, I think they're selecting Knecht more on his political experience than his accounting experience. However, based on the information I'm seeing, I'd go for Cort Arlint. I just think he's better qualified for the job. Curiously, the only people running for this office are Republicans. The current Assessor is Joshua Wilson, who has held the position since 2007. Wilson has done absolutely nothing to resolve the Incline Village tax assessment issue in a satisfactory fashion, so he's out. Fonda Crandall's background as a medical coder doesn't lend itself well to the position - I just don't think she's qualified for the job. That leaves Mike Clark. The current County Clerk is Nancy Parent, who is running in the GOP primary against Randy Amestoy. I'm not aware of any issues with Nancy's performance as County Clerk and it definitely appears she has the weight of endorsements between the two. Personally, I like Randy's "Eco-Friendly Office" platform, which is a too-clever-by-half name for supporting online filing of county documents, but it looks like Washoe County is already heading that direction anyway. Plus, speaking as an IT Manager, "paperless" initiatives require money, which we really don't have right now. I do think there are some serious savings, both in terms of cost and convenience, in supporting an initiative like that, but I'm not sure that really justifies replacing our County Clerk. So, I'm going to go with Nancy Parent on this one. I actually gave a different answer when I sent this email, and, to be honest, I voted a different answer on Saturday. For honesty's sake, I'll put down what I originally sent out, then I'll explain why I'm changing my mind below. The current County Sheriff is Michael Haley, who isn't seeking reelection. James Beltron couldn't even be bothered to spell check his filed candidate info, so he's out - yes, I'm one of those that do view that as a reflection of attention to detail and judge accordingly. Tim Kuzanek is the current #2 in the WCSO, so he's probably the most likely to win this one; he also has endorsements from several law enforcement agencies and Bob Cashell, so that's three strikes against him in my book. Jim Lopey also strikes me as someone that's been in the system a little too long - like Kuzanek, he's also been working in the Nevada Threat Analysis Center, along with various other agencies that cooperate with the federal and state governments, so he's out. This leaves Chuck Allen and David Butko. I think both are very solid candidates. Allen's focus is primarily on community engagement (which is good - we need more of that), while Butko's is on cost containment (which is good - we need more of that). If we could combine the two into some sort of super-Sheriff, I'd endorse that candidate in a heartbeat. I think that Allen's shot is the most realistic of the two since he already has some name recognition, so, if you're voting pragmatically, I'd choose him. I personally voted for David Butko for the alarmingly superficial reason that I liked both candidates about equally but David has the same name as I do, so... well, it was a coin flip and I had to make a choice somehow. I still think that, policy-wise, they're a coin flip. However, I think that Chuck Allen has the more realistic shot of the two and should thus get the nod. If he makes it past the primary, he'll be my vote in the general election. Department 11 - John Hope, Jr. I'll note right here and now that I'm not particularly well connected in the legal community so I couldn't tell you which judges or candidates are considered "problematic" in the industry. Caveat emptor. Department 5 is currently occupied by Hon. Deborah Schumacher, who is stepping down. The two running appear to be a current judge from District 2 and a private attorney. A while back I mentioned that I lean left, so, though it might be counter-intuitive for a libertarian to support a career state employee over a private sector employee, that's exactly what I'm going to do here and go with Cynthia. Way I see it, this is a Family Court judge - having someone in that position that's a little more on the touchy-feely side and has some experience in the chair is probably for the best. Your mileage, of course, may vary, which is why I'm explaining my thought process in the first place. Department 6 is currently occupied by Hon. Brent Adams, who is stepping down. The only one of the candidates with a useful web site is Doug Rands and his background isn't half bad. He also has the Veterans for Politics endorsement, which is a group that has also endorsed a number of Libertarian Party candidates down in Clark County, so that's another benefit in his direction. Lynne Simons' bio suggests a strong "law & order" approach (former Paul Laxalt staffer, mentions the "drug crime epidemic"), which leaves me a little cold - I somehow doubt she's someone who's looking to reduce victimless crime sentencing. Jenny Hubach, however, was a Reno News & Review "Attorney of the Year", and runs a marijuana-centric legal firm. So, guess which way this Libertarian is going? Department 11 is currently occupied by Hon. Chuck Weller, who appears to have made some "friends" - nothing like having a couple people run against you to drive home some dissatisfaction. Chuck used to have a radio show on KKOH, which suggests some conservative leanings - make of that what you will. Caren Cafferata-Jenkins is clearly the liberal in the race, though not in the hands-off "liberaltarian" flavor that I prefer. Frankly, her bio suggests some old school progressivism in her background, which leaves me shaking my head. John Hope Jr., meanwhile, is a nice middle ground between the two. Former veteran, not completely in the progressive tank, a little more balanced. He also has some wonderful charts illustrating why he's running against Weller. Department 14 is currently occupied by Hon. Linda Gardner, who is stepping down. The challengers for this one are former County Commissioner David Humke (Interesting fact - I ran against him in 2010) and John Springgate. Honestly, I think Humke's been collecting a public paycheck plenty long enough, and as Heinlein once said, "If you can't vote for someone, find someone to vote against." So, I'm going with John Springgate. So there you have it. Agree? Disagree? Tell me why in the comments below or on whatever social network you found this on. I'll note that, if the comment is something like, "Well, you need to get more educated on these candidates and the issues," I'll immediately agree and ask for places where I can find additional information.